I know the name of Brandon Sanderson but I’ve never read anything by him before this. I thought that this might be a good introduction to him and his work. I was wrong. White Sand is based on an unpublished work of Sanderson’s. Cool. I love the idea of using new/old material from an author and bringing it to life in a new way. And I really liked the concept here of ‘sand wizards’ on a desert planet. Though I will admit I was often thinking of Dune (the desert planet part). The story follows Kenton, a young man just learning to control his powers. But like many young men, he is full of vigor and a know-it-all sense of rebellion, willing to stand up to anyone he thinks is wrong (which is most people). Somehow, he needs to grow up both as a Sand Wizard and as a man. It is the only way he will be able to save his culture. There is a lot to like here. The concept and the characters are truly interesting, and it makes me eager to branch out and read some Brandon Sanderson. But this graphic novel doesn’t quite satisfy. First: it is dialog heavy. There are pages here that are difficult to see the art because of the abundance and size of word balloons. Good graphic novels really need to find the balance between telling the story with dialog and narrative, and telling the story with art. As I reflected on this, I was thinking about how difficult it likely was for author Rik Hoskins to adapt a work, not originally intended as a graphic novel, to the medium. And while it does happen, it occurred to me that not every written work translates to the graphic novel format well. The other problem with the book is with the art itself. The style of art isn’t too bad, but the art doesn’t seem to be matching the story. I don’t get a sense of story-telling, but instead a series of panels (which are sometimes so confusing we need the arrows to tell us which panel to read next). There’s so much more to graphic novel art than simply drawing a bunch of characters doing things. I also recognize that it must be difficult to draw panel after panel in which the background is generally sand. But once I again I think that not every work of fiction is suited to becoming a graphic novel. My digital ARC was poorly formatted to see the art. The art was constantly blurry, no matter whether I zoomed in or zoomed out, the image was blurry. It made it difficult to really appreciate the book from a review point of view. I want to read more Sanderson, based on the concepts here, but as a graphic novel, I can not recommend this. Looking for a good book? 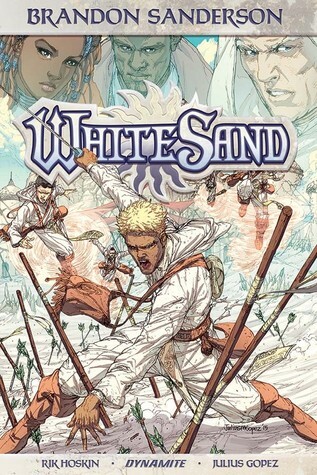 White Sand, a graphic novel based on an unpublished manuscript from Brandon Sanderson, is not well-suited to the graphic novel medium and is not helped by the author or artist, though the idea is promising.